No worry... I'm not that mad to change any authetic recipe. In fact, I closely followed the recipes as much as I could, and served it in a regular way (photos followed). While the adults were enjoying the food so much, the kids who haven't much exposed to Oriental food just stared at our big bread soaking in curry suspiciously. In order not to let them left out, I quickly whipped up this finger food... now everyone is happy! This Indian flat bread's (naan) recipe is from Mahanandi , her naan I think is the best we get in western home-kitchen! The top crust is chewy, the bottom's crunchy (baked on terror cotta) while the interior is tender and porous. Mahanandi even shows us her bread with a "pocket" puffed up! She also tells us the choice of toppings for naan, and how to make yogurt (one ingredient for making naan) at home. To make the mini flat bread... take out a tiny dough (about a size of walnut) from the fully-risen dough, flour the table, press the dough in the center with my wet fingers. I prefer not to use rolling pin in order to save the air bubbles inside. If you don't have a baking stone/terra cotta, you can place the shaped dough on a dark-coated pan so that the bottom will turn dark-brown and crispy. Bake in a hot oven for a few minutes. After they're done and warm to touch, spoon some chicken curry, garnish with cashews and coriander leaves. Your guests are the lucky ones to have a fabulous, creative host like you. Chicken curry combination looks great! It all looks like heaven, and that's beautiful naan. I agree, your friends are so lucky to have you cooking them these dishes. I love ur blog, u never fail to produce very well taken pics too! Oh I love naan! Yumyum! Indira, thank you! I'm going to make your naan regularly, too good! Next is to think about where I can "hunt" that live-culture for yohurt. 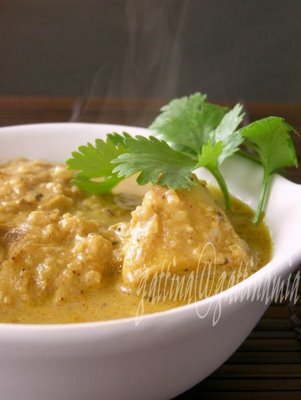 Sailu, your chicken masala curry is surely on our dinning table very often! Thank you! Small, mom and pop type, Indian restaurants often prepare their own yogurt to serve at restaurants. Also, Indian temples. Just buy a small cup of plain yogurt (No Raita), bring it room temperature and add a tablespoon to warm milk. 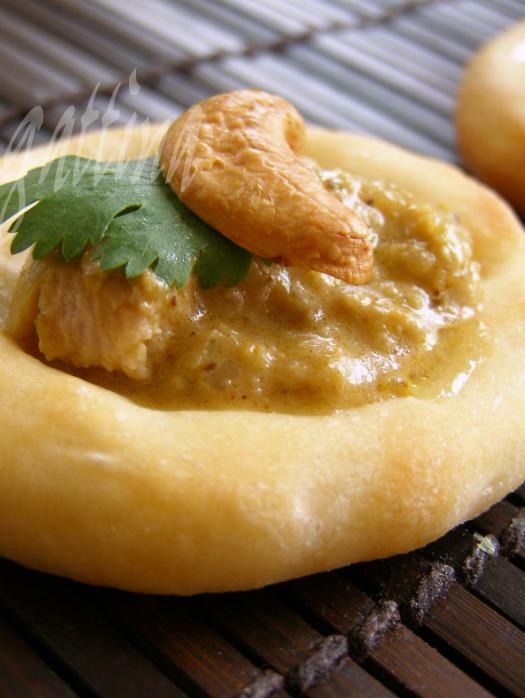 I am glad and happy that you approve of this naan recipe! Looks absolutely stunning! Everything. 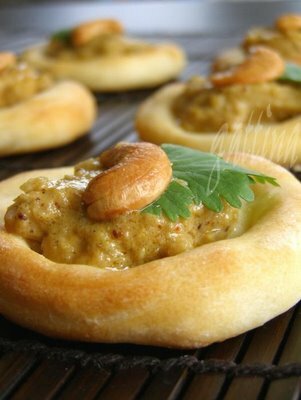 I would love to try those ingenious mini naans! Hi gattina...I tagged you for the 10 dishes I miss most of my mom's cooking meme...hope you play. Mini naan is a wonderful idea, tiny little dough boats for the curry !!!! A perfect tea party finger food. You made it really stunning with the casshewnut atop. 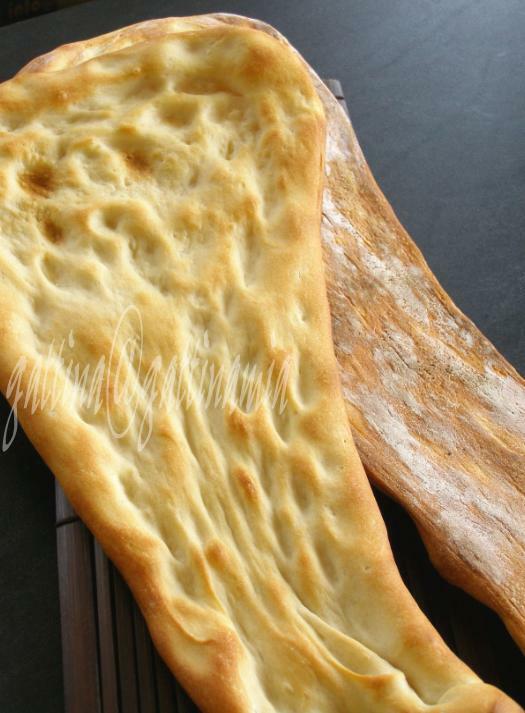 Mae, this naan recipe is simple and easy, hope you'll enjoy! I too love the idea of a mini naan. I want one right now. Everything looks so wonderful--your guests are lucky indeed to have you make all these treats for them. What memories they take away from a meal prepared by you! Gattina you are rocking with this truely creative mini Naan. Especially with chicken hmmmmmm my mouth is watering. Thanks for the upload of wonderful pictures too.